The Constitution (Scheduled Caste) Order 1950 was signed on 10th August 1950 by the then President of India which says that “No person who professes a religion other than Hinduism shall be deemed to be a member of the Scheduled Caste” which was later amended to include Sikhs (1956) and Buddhists (1990) in the Scheduled Caste net. This order is against the secular nature (Preamble of the Constitution) of the country, against Article 14(Equality before the law), article 15(Prohibition of discrimination of any citizen on ground of only religion), Article 25 (Freedom of Conscience and free to profess any religion), Article 26 (Equality before the law and equal protection of the law) and against the International Covenant on Civil and Political Rights, to which India is a party. That is why every year Dalit Christians and Dalit Muslims observe August 10th as Black Day throughout India. Civil Writ petition 180/2004 in the Honorable Supreme Court of India praying the deletion of paragraph 3 of the Constitution (Scheduled Caste) order 1950 is still pending for the past eleven years. The Constitutional Rights of Dalit Christians and Dalit Muslims are denied based on religion for more than 65 years. Different commissions appointed by the Government have clearly recommended that Dalit Christians and Dalit Muslims should be included in the Scheduled Caste list. “Constitution Scheduled Caste Order 1950 para 3 is unconstitutional and it is a black letter written outside the Constitution introduced through the back door by an executive order”. "We recommend that Para 3 of the Constitution (Scheduled Castes) order 1950, which originally restricted the scheduled caste net to the Hindus and later opened it to Sikhs and Buddhists, thus still excluding from its purview the Muslims, Christians, Jains and Parsis etc – should be wholly deleted by appropriate action so as to completely de-link the scheduled caste status from religion and make the scheduled castes net fully religion – neutral like that of the Scheduled Tribes”. The National Commission for Minorities has recommended that Scheduled Caste status must be extended to Christians and Muslims of Scheduled Caste Origin. The National Commission for Scheduled Castes (NCSC) too has given its consent. Till now twelve State Governments and Union Territories have recommended to Union of India for granting SC status to these people. The Bihar State Assembly, Uttar Pradesh State Assembly and Andhra Pradesh(united) state Assembly have passed resolution for granting SC status to Dalit Christians and Dalit Muslims in the years 2000, 2006 and 2009 respectively. Most of the National and Regional political parties have supported the demand of Scheduled Caste status to Christians and Muslims of Scheduled Caste Origin by writing letters to the Prime Minister and concerned authorities. We are profoundly pained that the rights of the minority communities of Scheduled caste origin are denied and delayed for many years. Our peaceful and democratic demonstrations will continue till our rights are attained. Throughout India, Churches of all the denominations observed August 10th as Black Day. On 10th August special mass and prayers were offered. 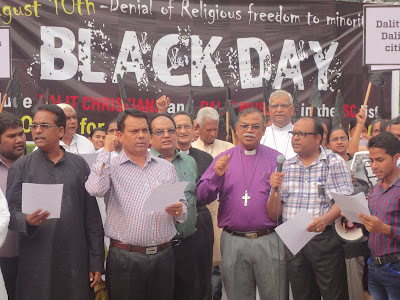 Meetings, rallies, demonstrations, hunger fasts, submitting memoranda, candle vigils and other forms of demonstrations were also organized by the Christian communities to show support for and solidarity with the suffering Christians of Scheduled Caste Origin. 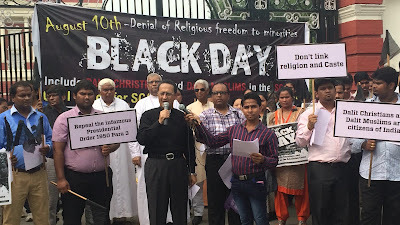 In Delhi Black Day was observed on 10th August 2015 from 4.00 to 5.00 pm in front of the Sacred Heart Cathedral main gate organized by CBCI, NCCI and NCDC. Rev. Dr. Roger Gaikwad, NCCI General Secretary, Most Rev. Anil Couto Archbishop of Delhi, Bishop Collin C. Theodor, Secretary NWICC, The Most, Revd. P.K. Samantaroy, Moderator, Rt. Revd. Dr. P.C.Singh, Deputy Moderator, and Mr. Alwan Masih, General Secretary of CNI, presided over the program. Mr. Ali Anwar Ansari MP of JDU and Mr. J.D Seelam (Cong) and many other MPs showed their support and solidarity for the demand. · The Union Government should come forward to resolve the issue immediately without further delay. · The Union Government should give appropriate answer to the query of the Supreme Court based on the recommendation of Justice Ranganath Misra Commission’s report.